Send a Message That the "New Tunisia Means Business"
​The National U.S.-Arab Chamber of Commerce (NUSACC) has just concluded its "Greenfield" trade and investment mission to Libya and Tunisia. 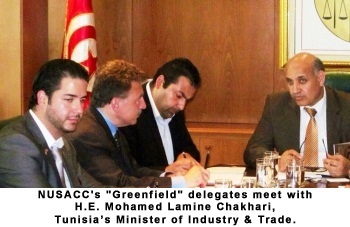 During the second half of the mission, dedicated to five days of meetings in Tunisia, delegates met with that nation's Prime Minister, Minister of Industry & Trade, Minister of Investment, Minister of Tourism, the Governor of the province of Sfax, the head of Tunisia's export promotion agency, and more than 300 Tunisian companies. Delegates also participated in a number of meetings with Hon. Robert Hormats, U.S. Under Secretary of State for Economic Growth, Energy, and the Environment, and Hon. Gordon Gray III, U.S. Ambassador to Tunisia. "Tunisia rolled out the red carpet for our delegation, sending a strong signal that the new Tunisia means business," said David Hamod, President & CEO of the U.S.-Arab Chamber. "It seems that most everyone in our delegation came away from Tunisia with new business and new partners." The high-level delegation of 13 U.S. companies, representing ten different states, served to "bookend" the experiences of the two U.S. Ambassadors serving in Libya and Tunisia, respectively. 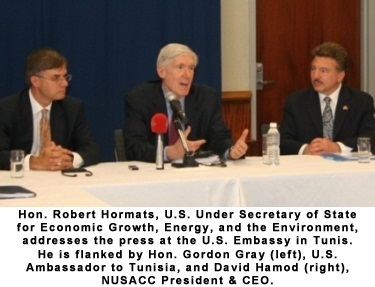 NUSACC's mission brought the first U.S. business delegation to visit Libya during the tenure of Ambassador J. Christopher Stevens, and the delegation is likely to be the last one to pay a visit to Ambassador Gordon Gray III, who is winding down his tenure in Tunisia after nearly three years there. 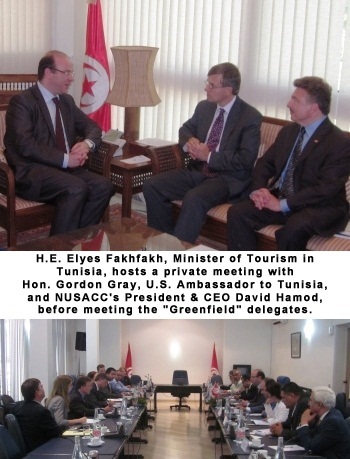 Both ambassadors have excellent reputations among Libyans and Tunisians, respectively. The trade & investment mission officially kicked off in Tunisia with a meeting with H.E. Hamadi Jebali, Tunisia's Prime Minister, who highlighted opportunities in such promising sectors as renewable energy, tourism, agriculture, and information & communications technology. H.E. the Prime Minister said that this visit sent a very positive message to the Tunisian people that the U.S. Government and American businesses are very keen to work with the Republic of Tunisia. Tunisia does not have oil & gas reserves like its neighbors to the East and West, Libya and Algeria, respectively, but Tunisia compensates for this lack of natural resources by boasting one of the best educated and most literate populations in the Middle East and North Africa (MENA) region. This international sophistication, coupled with the fact that Tunisia has been a constitutional republic for more than five decades, goes a long way toward explaining why Tunisia appears to be managing its post-revolution transition to democracy better than its North African neighbors, Egypt and Libya. ​Trade has served as the lifeblood of Tunisia since the days of Carthage, and that is not likely to change anytime soon. For years, Tunisia has boasted one of the highest per-capita GDPs in Africa and the Middle East, and the World Economic Forum has historically ranked Tunisia as the most competitive economy in Africa. According to the U.S. Embassy in Tunis, investors find Tunisia attractive because of that nation's relatively low-cost but highly skilled labor, as well as Tunisia's access to EU and African markets. In addition, government investment incentives have drawn U.S. investors to such export-oriented sectors as call centers, electronics, agribusiness, aeronautics, automotive parts, and textile manufacturing. In a meeting with NUSACC delegates, H.E. Mohamed Lamine Chakhari, Tunisia's Minister of Industry & Trade, highlighted such sectors as manufacturing, mining, textiles and energy, all of which are part of his ministry's portfolio. He promoted investment in Tunisia, noting that for local partners of U.S. companies, exports amounting to just 0.01 percent of the U.S. market would represent significant sales for any Tunisian company. Minister Chakhari touted his nation as a platform for commercial cooperation throughout the region, particularly in Libya. Accessing the Libyan market in concert with Tunisian partners was a theme that was heard over and over during the NUSACC delegation's visit to Tunisia. Libya and Tunisia have historically maintained strong diplomatic relations, in part because many families straddle both sides of the border. This was very evident during Libya's revolution, when hundreds of thousands of Libyan refugees streamed into Tunisia and took up residence with local families -- many of which had never met before. ​By most accounts, the best Tunisian city for accessing Libya is Sfax, a 350-mile drive from Tripoli, Libya's capital. The Port of Sfax was founded in the year 849, and it has been a commercial hub ever since, with a national reputation for producing hard working and highly successful businessmen and women. Sfax is number one in agricultural production in the nation, its engineering school with Egypt (ENIS) is tops in the Arab world, and Sfax boasts the #1 university in North Africa. 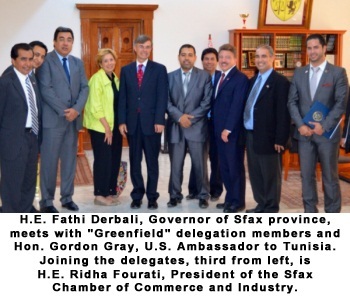 The Sfax Chamber of Commerce & Industry and the Tunisian American Chamber of Commerce (Sfax chapter) provided a very warm welcome for the NUSACC delegation. In addition to organizing an executive briefing and an exchange of gifts, the Tunisian chambers hosted business-to-business (B2B) meetings with dozens of companies, followed by a sumptuous dinner at the home of a local business leader. The Governor of Sfax province, H.E. Fathi Derbali, warmly welcomed the NUSACC delegation -- the first U.S. delegation to visit Sfax in 15 years -- to his offices. In remarks about the unique role of Sfax in Tunisia's economy, he described the Taparura project, an ambitious development designed to revitalize the Sfax region and improve the quality of life there, in large part through environmental remediation. Named after the ancient Roman settlement that preceded Sfax, this 73 million Euro project includes beach and landfill restoration and will create mixed use opportunities, including housing programs. ​In Sfax, delegates learned that more than 500,000 Libyans come to that city each year for medical treatment. Matthew Charkhkar, a delegation member and President of Harmony Medical Solutions, based in Tennessee, noted that Tunisia "has traditionally been a reliable country for medical tourism, and that presents a good market for medical equipment -- particularly in the private sector. In addition, there are opportunities for the introduction of new, emerging technologies, and that is either non-existent or rare in the region." Charkhkar is a veteran of NUSACC trade & investment missions. In his view, the Greenfield mission "could not have come at a better time. As Tunisia transitions into a new era, there are many opportunities. In the healthcare sector, for example, Tunisia seems to have a solid base of talent to support its needs." The availability of qualified, multilingual talent in Tunisia was another theme that surfaced throughout the delegation's visit. In light of the close relations that Tunisia shares with Libya, the former is well positioned to assist the latter to build capacity during Libya's gradual transition to democracy. ​One of the sectors that is most influenced by the availability of a skilled talent pool is tourism, a point that Tunisia's Minister of Tourism, H.E. Elyes Fakhfakh, made to the delegates during a lengthy meeting in Tunis. He highlighted the fact that his ministry is now engaging young technicians who can harness technology to serve as a catalyst to develop and brand Tunisia's tourism initiatives. He told delegates that tourism creates up to 11 percent of Tunisia's Gross Domestic Product (GDP) and accounts for 15 percent of the nation's workforce. As part of his ministry's five-year global strategy, Minister Fakhfakh suggested, he intends to bring more Americans to Tunisia. At present, only about 20,000 Americans visit each year, a drop in the bucket compared to the number of visitors from European countries -- eight million -- who make up 80 percent of Tunisia's visitors. He suggested that an Open Skies Agreement with the United States could have a major impact on these numbers, as would a revamped investment code that provides greater incentives for American investors in the hospitality industry. NUSACC delegates participated in two economic forums during their visit to Tunisia. 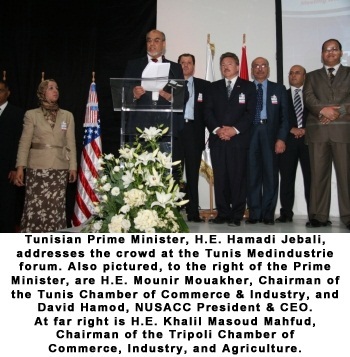 The first, "Tunis Medindustrie 2012," was organized by the Tunis Chamber of Commerce and Industry, an important partner of NUSACC during the Greenfield mission, in association with Tunisia's Foreign Investment Promotion Agency (FIPA). This business conference and exhibition highlighted Tunisia's strategic positioning along the shores of the Mediterranean as a destination for manufacturing, especially light industry. The second forum, "Tunisia Investment Forum 2012," organized by FIPA, highlighted the importance of Foreign Direct Investment for Tunisia. Keynote speakers at this event included U.S. Under Secretary of State Robert Hormats and David Hamod, President & CEO of NUSACC. In his remarks, Hamod cited former Secretary of State Colin Powell, who said that capital "goes to countries where women can work, children can read, and entrepreneurs can dream." Tunisia is one such country, Hamod suggested. He went on to say that U.S. companies, unlike Chinese companies, "will not shower Tunisia with money." However, Hamod noted, "We can provide you with something that is much more valuable in the long run: knowledge. If one side of the 'investment coin' is technology transfer, then the other side of that coin is knowledge transfer. In my opinion, American expertise, know-how, and productivity represent the best investment that money can buy." H.E. Riadh Bettaieb, Minister of Investment and International Cooperation, highlighted some of the steps that Tunisia is taking to attract foreign investors, including overhauling the nation's investment laws and diversifying Tunisia's economy. He noted that industrial productivity is up ten percent over the past year, and he expects that private investment in Tunisia will grow 15 percent in the next year. "Tunisia's industrial fabric is healthy and developed," said Minister Bettaieb, and Tunisia is a "gateway to Africa and a regional hub for higher education." Tunisia has the greatest comparative advantages of any nation in Africa, he suggested, and "the bottom line is that we are creating a climate of confidence for investors." ​​In his remarks at the launch of the Forum, Minister Bettaieb said that Tunisia's economy is "showing signs of recovery" and that investment indices are on the upswing, reflecting the confidence that foreign investors have in Tunisia. Foreign Direct Investment (FDI) in Tunisia is up 41 percent during the first five months of 2012, he said, and 62 new enterprises have been created, 37 of which are in manufacturing. His ministry is laying groundwork for a "road map" that will highlight Tunisia's investment opportunities, Minister Bettaieb said, and he plans to open a single point of contact to serve as a clearinghouse for all of Tunisia's investment stakeholders. ​The Investment Minister's upbeat assessment is consistent with a forthcoming study by the National U.S.-Arab Chamber of Commerce that forecasts challenges for Tunisia in the short-term, followed by respectable economic growth in the longer term. Real GDP growth, flat in 2011, is slated to grow to 4.8 percent by the year 2015. U.S. merchandise exports, at just over $500 million last year, are on track to more than double to $1.24 billion by 2015. FIPA reported recently that foreign direct investment grew 35 percent in the early months of 2012, and the number of visitors to Tunisia is expected to grow by 20 percent in 2012, according to the Ministry of Tourism. Tunisia's emphasis on tourism was apparent to David Muirhead, a delegation member and Project Director of Morganti, a construction firm based in Connecticut. He noted, "In part as a result of this highly successful trade and investment mission, Morganti has mobilized a team in Tunisia to investigate business parameters as a starting point for opening a platform in North Africa -- rebranded as the 'Southern Mediterranean' by Tunisia's Minister of Tourism -- beginning with plans to open a new office in Tunisia to use as a springboard into Libya and Algeria." -- Providing loan guarantees to enable Tunisia to borrow from international capital markets at reduced rates, thereby bringing down the cost of financing Tunisia's reform agenda. Incentives provided by the U.S. Government are intended to attract business in goods andservices. One of the services that will be most needed by U.S. companies is legal advice. Kathy Bailey, a delegation member and Managing Shareholder at Bailey Law PC in Washington DC, emphasized the importance of paying a visit 'on the ground' to Tunisia. "The Tunisian business environment is still not well known to most Americans," she said, and "the absolute best way to learn about a country is to go there. The NUSACC mission gave me the opportunity to meet with local lawyers and get an understanding of the legal environment for business in Tunisia. This was a very valuable experience!" ​This sentiment was echoed by William Lott, President & CEO of Triple L Construction, based in Louisiana. "During my visit, it became clear to me that Tunisia has a large, educated population and its geographic location makes it a perfect platform to increase trade with Europe and Africa and to act as the gateway to cultivate and open new markets," he said. "Having traveled throughout the city of Tunis, one can easily see that there are lots of ongoing construction projects. I was very pleased with my stay in Tunisia, and I plan on following up on discussions and opportunities available to my company in Tunisia." 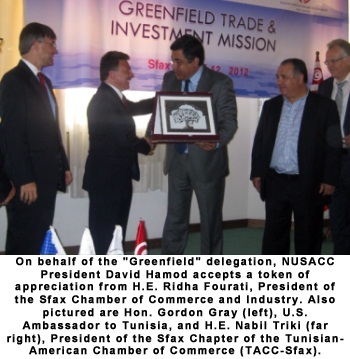 In support of U.S. exports and investment, and in partnership with the Tunisian-American Chamber of Commerce (TACC) and the Tunisian Union of Industry, Trade and Handicrafts (UTICA), NUSACC and its partners helped to provide access to government and business leaders in both nations. David Muirhead, of Morganti, noted that the mission "has facilitated introductions to key decision makers in Libya and Tunisia. We also appreciated the dedicated support of the U.S. Embassies and the local chambers of commerce in helping to navigate the respective business communities and ministries -- many with newly appointed transitional leadership -- in Libya and Tunisia." Nader Ramadan, a delegation member and Market Consultant for Maryland-based United Trading, put it this way: "Many thanks to NUSACC's extremely talented and professional team for providing an exceptional business development platform to make business opportunities both available and achievable." ​As in Libya, delegates carved out time to gain a better understanding of Tunisia's history. They visited the Roman amphitheater of El Jem, constructed around the year 238, a facility that was used mainly for chariot races and gladiator competitions. The structure holds 35,000 spectators, second in size only to the Flavian Amphitheater in Rome, which holds 45,000 spectators. Delegates also visited Carthage, which was established as a Phoenician colony in the first millennium BC. At its peak, this Punic city became a major power in the Mediterranean and a threat to ancient Rome, particularly under the leadership of Hannibal, whose march on Rome across the Alps remains one of the greatest feats in military history. Following the Third Punic War, Romans destroyed the city in 146 BC. 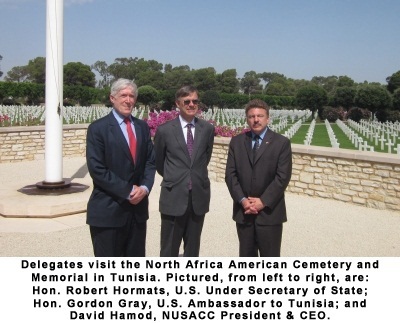 In addition, delegates accompanied Under Secretary of State Robert Hormats and Ambassador Gordon Gray to the North Africa American Cemetery and Memorial, where a wreath was laid to commemorate American men and women who lost their lives in service to the nation, mostly during World War II. Nearly 3,000 U.S. servicemen and women are buried there, and the memorial also includes a "Wall of the Missing" to honor the 3,724 Americans in the North Africa theater who were never found. Against this historical backdrop, the depth of America's longstanding partnership with Tunisia takes on additional significance. In the words of Hon. Barack Obama, President of the United States, "The United States reaffirms its commitment to the Tunisian people as they move toward a democratic future that offers dignity, justice, freedom of expression, and greater economic opportunity for all."